Hello and Welcome to our preview for Hampshire versus Sussex match. 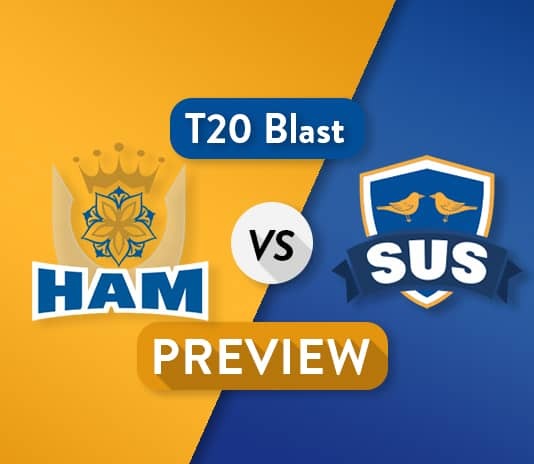 We are covering HAM vs SUS Dream11 Team Prediction, Preview and Probable Playing XI for the T20 match. The match is to be played at The Rose Bowl, Southampton. This will be thrilling encounter between table topper Sussex and bottom rank team Hampshire as if now, in the South Group, which has been scheduled in Hampshire home ground “The Rose Bowl”. They will be looking for their first win in this tournament in the home ground, whereas Sussex will try to maintain their winning momentum. Hampshire will try to overcome their previous match batting disaster against Glamorgan as they has only managed to score 105 in their 20 overs and losing the match by 63 runs, whereas Sussex are in a great form as they managed to win both the matches comfortably against Essex and Glamorgan, but there is a chance Hampshire can show their quality as they will get home support in this match and they have a very good side and they are tournaments favorite. Hampshire have a good bowling unit with the inclusion of Mujeeb Ur Rahman in their side, where as their batting order have to prove themselves particularly their top order should look for a good opening partnership. Sussex have a strong middle order batsmen like David Wiese, Micheal Burgess and Jofra Archer, and they have a fabulous bowling unit with the world class bowlers like Rashid Khan, Jofra Archer and David Wiese. David Wiese is in tremendous form with the ball and bat for Sussex in the first match and also Luke Wright will continue with his form that he has shown in his last match. Hampshire will be looking to bounce-back from the last defeat. HAM vs SUS, South Group Match, T20 Blast, 2018. Rilee Rossouw, Sean Ervine, Liam Dawson, James Vince (c), Chris Wood, Gareth Berg, Sam Northeast, Colin Munro, Kyle Abbott, Lewis McManus, Tom Alsop (wk), Joe Weatherley, Ryan Stevenson, Mujeeb Ur Rahman. Luke Wright (c), Will Beer, Laurie Evans, Danny Briggs, David Wiese, Ollie Robinson, Michael Burgess (wk), Philip Salt, Chris Jordan, Tom Bruce, Rashid Khan, Jofra Archer, Delray Rawlins. An unchanged 14-man squad has been named for this match. Joe Weatherley, Ryan Stevenson, and Sean Ervine included alongside the final XI from last Friday’s match-up. New signings Colin Munro and Mujeeb Ur Rahman both world class players given a good chance to perform well. There is slight chance that J Weatherley or S Ervine included in playing XI. Only one changed is expected from this side. Chris Jordan is included in the squad replacing George Garton. Tymal Mills and Stiaan van Zyl will be unavailable due to injury. Colin Munro, Rilee Rossouw, James Vince (c), Sam Northeast, Tom Alsop/J Weatherley, Liam Dawson, Lewis McManus (wk), Gareth Berg, Kyle Abbott/Ryan Stevenson, Chris Wood, Mujeeb Ur Rahman. Philip Salt, Luke Wright (c), Laurie Evans, Tom Bruce, Michael Burgess (wk), David Wiese, Jofra Archer, Rashid Khan, Will Beer, Chris Jordan, Danny Briggs/Ollie Robinson. This Team is for Grand Leagues. Captain and Vice-Captain choices: R Rossouw, L Dawson, C Munro, Rashid Khan, Luke Wright. For Grand Leagues: Philip Salt, James Vince, Sam Northeast.